These bed side tables complement the bed frame I made for Sean in 1999. Each table has three dovetailed drawers and sliding doors below. As I design and build more and more furniture for Sean, we are developing a theme of design, where a detail from one project will carry over to the next design. 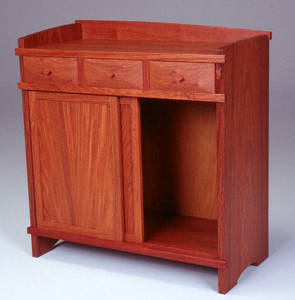 The drawer fronts of the bed side tables have the same curved front as the top panel of the dovetail box. The tables are made from rare red narra wood, which was submerged in the Mekong river for years, and recently retrieved by an underwater logger and milled into lumber. I have made Sean's bed frame, trapezoid bookshelves, a dovetail box, and now these side tables from this limited stock.